Fishermen who just keep on fishing, researchers who get behind the facts and national governments who do not feel like intervening. The mountain of fish that has just been dumped on the concrete floor by rusty trucks is smoldering under the bright sun that peeps through a crack in the factory door. A bulldozer will slide the unappetizing pile of sardinella in the rotating machines to grind fishmeal. What is now happening with sardinella fishing in northwest African waters is, according to herring biologist Ad Corten, the same as ever, around 1975, with the North Sea herring. At the beginning of this month, Corten presented the comparison at a fishing symposium in Nouadhibou (Mauritania). ”As I described earlier in this magazine, things have gone completely wrong with the sardinella in Mauritania, Senegal and the Gambia in recent years. After the Dutch freezer trawlers were largely driven out of the area in 2012 due to the expansion of fishing limits, the Mauritanians used the created hole to set up a fishmeal industry at breakneck speed. The fish required for this (mainly sardinella) is supplied by Turkish purse seiners, who are allowed to fish in the coastal zone. Within a few years the total supply for fishmeal was already much larger than the amount previously caught by the freezer trawlers. Now that the sardinella is also attacked close to the coast all year round, even within the 12-mile zone, the stock has fallen to the lowest level in history in a short time. The depletion of the sardinella stock is not only a problem for Mauritanian fishing, but also for artisanal fishermen in Senegal and the Gambia, who fish for the same population of fish when it is present in their waters during the winter. When the Dutch were still fishing for sardinella, the fishing vessels provided a wealth of information about the stock. We had reliable catch statistics, the ships took Mauritanian observers on board and the daily catch of the ships was an accurate measure of the size of the stock. Since the departure of the Dutch, researchers have been without any data. 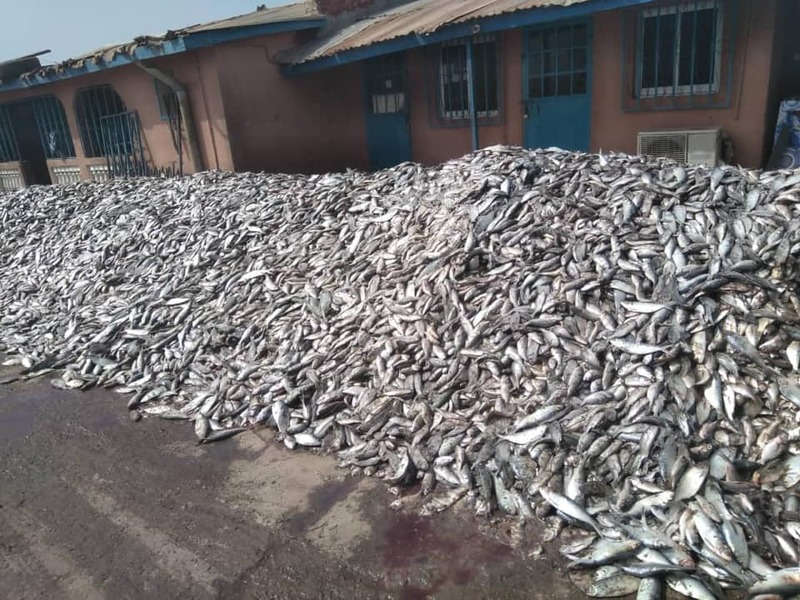 The fishmeal factories are fraudulent with their supply figures and the Mauritanian investigation has no manpower and material to sample the factories themselves. The result is that researchers actually have no idea what is happening. They have not been able to make file estimates for five years, nor have they been able to provide concrete management advice. The governments in Mauritania and Senegal are not ready to intervene and reduce fishing pressure. While in Mauritania there is a restriction on the amount of sardinella that fishmeal plants may process. The sad thing is that this measure is not controlled. The current state of affairs at sardinella gives me the feeling that I have experienced this all before; a “déjà vu” as the French say. In the 1970s, I was responsible for the research and policy advice of North Sea herring as a herring biologist at RIVO (the predecessor of IMARES and Wageningen Marine Research). As older readers will still remember, herring went completely wrong at the time. Due to the development of a fishmeal industry in the Scandinavian countries, the demand for herring increased sharply, with the result that the catch exploded within a few years. Biologists knew nothing about the situation. They felt that things went wrong with their clogs, but they did not have sufficient data to perform assessments and give advice. They had no idea how much the stock had actually fallen, and they were also very careful about giving advice. That formulation illustrates on the one hand the ignorance of the biologists at that time, and on the other hand their fear of giving clear advice. Only in 1975, when the adult stock had fallen to 100,000 tons (less than 3 percent of the original stock), did biologists come to the conclusion that it was best to close the fishery completely. Following the advice of biologists in 1975, the Dutch government was not prepared to take tough measures. This was partly due to the fact that the North Sea was still a free area at that time, and that a prohibition of fishing could only be introduced on a voluntary basis. That of course never worked with the twenty different countries that fished there then. The situation changed on January 1, 1977, when the countries around the North Sea jointly extended their economic zones to 200 miles. From that moment on, the North Sea became the property of the countries around it, and it became easier to introduce a catch stop. The map of Northern Europe. The distribution of herring in the North Sea and the distribution of sardinella off the coasts of Mauritania, Senegal and Gambia. On March 1, 1977, the UK decided to follow the advice of biologists and to completely ban herring fishing in its waters. The Dutch government strongly opposed this and gave permission to the Dutch fleet to continue fishing in the British zone. Two Dutch trawlers were subsequently arrested by the Royal Navy and brought to a British port. A political riot arose, in which our ministers of Agriculture & Fisheries and of Foreign Affairs both accused the English of evil intentions. Only after our Minister of Fisheries had visited the RIVO and had been briefed by the researchers there, did the Dutch government sulkily agree with the fishing ban. There are major similarities between the situation of sardinella at the moment and the North Sea herring in the 70s of the last century. In both cases, the stock is being depleted by a rapid increase in catches due to the development of a fishmeal industry. And in both cases this happens at a time when there is still no question of international management. At that moment, it is pointless for one country to stop fishing because the other countries will just catch more. Setting up an international management system takes time, and it is not there at the moment. Often a fish stock must first completely collapse before there is sufficient political support for a reduction in fishing effort. And such a restriction is, of course, also easier to achieve after the existing fishery has gone completely bankrupt. Catches of sardinella near Mauritania in the period 2000-2017, with catches by pelagic trawlers above and catches for fishmeal. What can we do for Africans now? A further collapse of the sardinella file seems inevitable at this time. Biologists can no longer advise, and the national governments do not feel responsible for saving the existing fishery (exactly as in the Netherlands in the past). It is only when the majority of fishing in Mauritania and Senegal has gone bankrupt that national governments will hopefully realize that they must do something. Catches North Sea herring in the years 1950-1975, with above the catch for human consumption, below the catches of Denmark alone and in the middle catches for fishmeal. We cannot force the Mauritanian and Senegalese authorities to take the necessary measures. The willingness to do so must come from their own. What we can do is ensure that sufficient scientific information is collected to continue to provide advice. As a result, the file can be built up faster once the politicians are prepared to do so. From that point of view, it is disappointing that both the EU and the Dutch government are so far unwilling to support West African countries in this. Proposals for an international project aimed at improving the research and management of West African sardinella have been referred to the waste bin by both the EU and our own Ministry of Development Cooperation in the past year. The fact that the Dutch government struggled at the time with the introduction of the necessary catch ban for North Sea herring, can be explained on the one hand by the lack of knowledge and on the other hand by the lack of support from the company. ,,Only after the British closed fishing in their waters, I was invited, together with the RIVO director, for an emergency meeting with the secretary general of the ministry. The top of the ministry turned out to be completely unaware of the biological recommendations issued in previous years; they were all put in the drawer by lower officials. Furthermore, the company was not prepared to voluntarily stop fishing as long as there was one herring in the North Sea. Dutch fishermen therefore claimed that there was still so much herring in the sea that you “could walk over it”. In addition, according to Corten, governments have a practical argument to let the matter run its course when a fish stock goes completely wrong. When the sea is completely empty, the companies go massively bankrupt and the government does not have to step in with buy-out or silence arrangements. It is a cynical argument, but it is used more often in practice, including by the Dutch government in the proposal to introduce “organic management” in 1993. Corten is probably the only fishery biologist who has experienced both situations (North Sea herring in the seventies and sardinella now) in working practice, respectively as the then youngest member of the ICES herring working group, and now as the oldest member of the FAO working group for pelagic fish in the northwest -Africa.